Today's session with lovely 3-4 year olds was on prayer but namely "The Lord's Prayer" So I had a nice book, which I used but I needed something for the children to actually get to grips with the prayer. So cue, Godly play inspired session (what a surprise!) I googled, but the two versions I came up with were not at all what I would have done but here's my version. This is a very special box, it looks like a gift and very special present. (Open slowly)- It is a gift! A gift from Jesus, he told his friends that we could pray this prayer anytime and God will hear. These word's are like a gift from Jesus. I then pointed to each part of the strip saying this part is saying "thank you" "please" "sorry" to lead us to next section. We could have done usual wondering and I had planned to do "what is your best part? but I felt on this occasion best not to, as I planned to pray for sometime with the children and attention only goes so far at this age. Having said that, oh my goodness the children were AMAZING watching the prayer. Absoloutly transfixed, made me rather emotional. 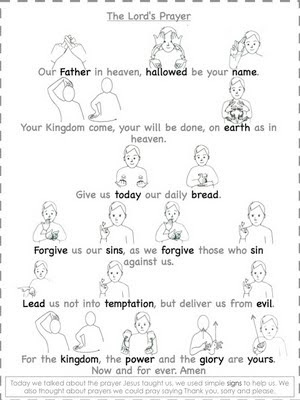 This is an amazing way to bring the Lord's Prayer to life. I have pinned this to my Teach Children about Jesus board. Stumbled on this about 15 minutes before the service and had all of the pieces on hand in my office. It really resonated with the children and it was a lovely liturgical art piece for the rest of the service. sounds great, you use actions. I have naturally used sign language as it is more inclusive of those with additional needs/ hearing impairment. Its funny since this was written I have become mum to a little girl who is deaf! The only part that needs to make us think twice is the symbolism of black as sin, evil and bad............and white as the good path. This is called systemic racism........where inadvertently we say black is bad and white is good. We need to find other ways of doing this part. Black is darkness, white is light. No need to try to make it racist. Humans have beautiful skin tones from deep brown to pale pink. No one has black skin or white skin really. I would love to be able to download The Lord's Prayer for my daycare kids. Do you have a pdf file of it? I just used this this morning for our children's sermon. The children were instantly mesmerized. We then sang together the Lord's Prayer that we use during our service. Both children and adults were blessed by this. Thank you for sharing your excellent idea!